As one of the leaders in the domain of GPS navigational devices, Garmin is a world-famous brand. Now, the same manufacturer brings Garmin Zumo 595 to the global market and with it an excellent product for all those who are looking for an all-around effective navigational solution. As its slogan underlines, this device was created for the adventure, but it was also born to ride. Garmin Zumo 595 is primarily a motorcycle navigator that offers a large 5-inch touchscreen that is very friendly for glove-clad fingers. The device, just like its screen, can operate both in portrait and landscape mode while providing a high-res image quality. Because of the Transflective technology that is included in the motorcycle sat nav screen, the device will have a reduced glare, which makes it display exceedingly easy to read, even when the rider is in full sunlight. 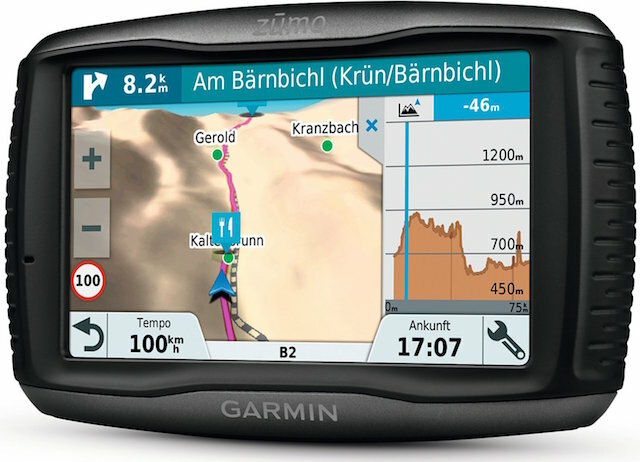 One of the device's main features is Garmin’s Adventurous Routing system. This will allow the aficionados of motorcycle rides in the great outdoors to seek out hilly and twisty roads, providing them with some of the best rides of their life. The embedded Bluetooth technology will allow Garmin Zumo 595 to be synced with a smartphone, a helmet or a headset, providing a safe ride that will be completely hands-free. In the same synced mode, the navigational device will be able to present notifications for texts, calls, app alerts and much more, all of which will appear right on the Garmin’s display. Not only that, but the device will be able to link to the smartphone’s carrier connection and provide live weather and traffic information using its Smartphone Link application. The same app will also allow the rider’s friends to easily locate their whereabouts and track their movement in real time. With the device, the users can also enjoy music, ranging from the regular MP3 files to the streaming of the playlists from Spotify music service. For those who love to record their adventures, the device can also be linked to a camera and this way the same can be easily controlled. Naturally, all Internet-connected features are completely secure against any unwanted intrusions or data theft. But these are just a fraction of the possibilities that come with Garmin Zumo 595. Riders alerts are designed to make any ride a lot safer and these provide the riders with warnings about sharp curves, speed changes, school zones, railway crossings and much more. The same warnings also cover one-way streets and other regular issues that can now be easily avoided. When it comes to fuel, Garmin Zumo 595 will make sure that one is running on an empty tank. With a built-in system for calculating fuel consumption, it will notify the rider when the time for a refuel comes near, including noting potential gas stations on the desired route. An additional feature of tire pressure oversight will easily link up with the Garmin Tyre sensor and constantly transmit data about the levels of air the bike tires. For the navigation itself, Garmin Zumo 595 is second to none. Its Real Directions feature is the industry standard for spoken direction navigation, which includes the mentions of recognizable landmarks, likes buildings and traffic lights. The lifetime map update will keep the device loaded with all the latest maps and points of interests while the Real Junction View will provide an easy navigation through complex and difficult interchanges. A full 3D view is also available to resolve any issue that the rider might have with the upcoming portion of their route. Thanks to all of this, there is no doubt that Garmin Zumo 595 is a great navigation device for anyone who wants to experience the very best on their motorcycle. Most importantly, the Garmin 595LM is a major step up from the out going 590LM which was a fantastic sat nav unit. The real problem with the Garmin 595LM us the price which puts itself just a little out of the price bracket for the casual rider to buy and use and for this reason would recommend that if you do want a Garmin motorcycle sat nav then take a look at the older 590LM given that now it has had a slight price drop to make it more affordable.